Mayor Ferdie called for Emergency Meeting of the Peace and Order Council, PNP COP declared no threats on terrorism. | Be Informed, Every BaliwageKNOW deserves to Know. Mayor Ferdie called for Emergency Meeting of the Peace and Order Council, PNP COP declared no threats on terrorism. 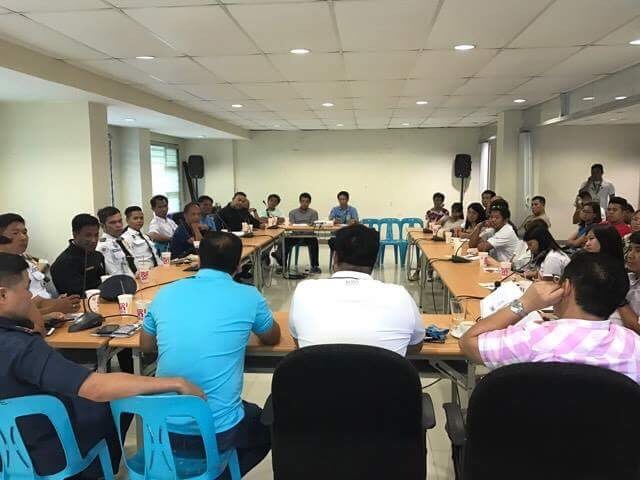 Mayor Ferdie Estrella called for an emergency meeting of all heads of Security of malls, supermarkets and schools this afternoon at the Municipal Conference Hall to keep them on guard and vigilant at all times despite ruling out terrorism as the cause of the tragedy last night at Resorts World Manila. PNP Baliwag Chief of Police Froilan Uy declared that reports lingering on social media regarding presence of Terrorist group ISIS was merely a bad joke, caused by a very irresponsible netizen. The post that was reshared over a thousand times was deleted as of this time. Possibly, that post and the recent happenings in Marawi and Resorts World Manila have heightened fears of the public. Mayor Ferdie Estrella however, is not taking any tables unturned. He reminded security units and the public to remain vigilant at all times. He also ordered security officers to be strict in inspecting bags of any shoppers coming in of malls and other establishments. Nobody will be exempted even I or any of my personal bodyguards must be searched the mayor quipped. If there are suspiscious packages or any suspiscious looking faces in the community and during an emergency situation, please contact our hotlines 24/7. The contact support can also answer questions or take your complaints round the clock. People who are posting unverified information must be reported immediately to our hotlines or the police force. 2 Baliwagenyo, mga biktima ng trahedya sa Resorts World Manila.